It’s just too bad there wasn’t more room on the slide for a larger font. It would have been classier if those slide serrations weren’t in the way, and they could have engraved “MAGNUM RESEARCH” about 1 inch high on there too. Jokes aside I’m sure it’s a perfectly great 1911. You can pick it up only at Cabela’s for between $750 and $1100. Thoughts? Do you wish “.45 ACP” was engrave really large somewhere too? They even wrote “G” at the end so that people know what you are when they see you with this strap. Don’t know why MR, STI, and Rock Island have to ruin good guns like that. Only thing worse was from that TV show when the gun shop put a huge G U N S M O K E logo on all their custom work. Send a gun in for a sight install and it comes back with that big logo – I’d be pissed! For that price, I would want, “ME TOO” engraved on the slide also. Does anyone buy this crap? How do all these 1911 companies stay solvent when they are all selling what is essentially the exact same thing as everyone else? Aren’t the AR companies doing the same? I got rid of a S&W 1911 for exactly the same reason. Just couldn’t stand the huge lettering. 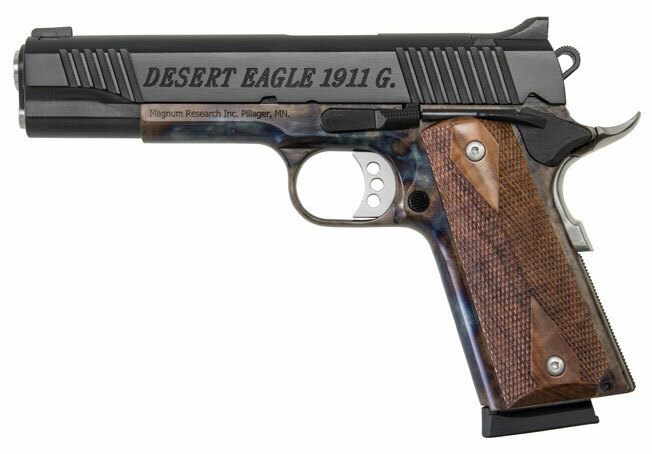 What a missed opportunity to get deagle engraved on it. Somebody better drop a “Three Wolf Moon” review on Cabela’s page! Color case hardened frame tho. Dang. I could maybe deal or swap the slide for that frame.